A loose dog can easily distract the driver. An unrestrained dog can block or move the steering wheel, gear shift, and gas/brake pedals. A loose dog can be injured or killed by an airbag. When hanging its head out of a car window, debris from the road can injure a dog's eyes, nose, and mouth. In the case of an accident or even stopping short, your dog can become a dangerous projectile. This not only poses a risk to your dog; it is a risk to you, other people in the car, other drivers, and even pedestrians. In the case of an accident, a loose dog can become a threat to emergency workers trying to rescue you from a damaged car. Or, your dog could escape and become lost. Do your dog, yourself and everyone else a favor and restrain him. In addition, do not allow your dog to travel in the front seat, even if restrained. Keeping your dog restrained and in the back will decrease the likelihood of a distraction-related accident and keep your dog safer in a crash. However, car travel for restrained dogs is not without risk. Obviously, it is most dangerous to travel with no restraint at all. 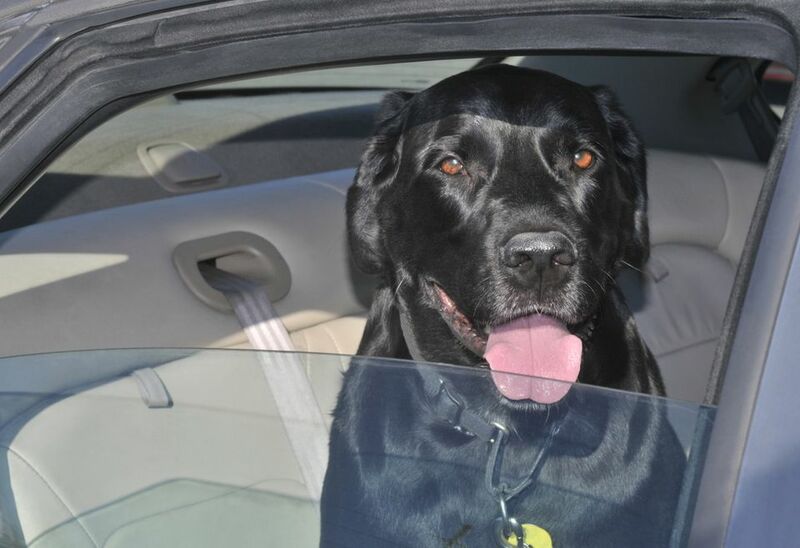 Your best bet is to find the right restraint for your dog and increase his odds of survival in a car crash. And, most importantly of all, drive safe! A crate or kennel is one of the safer ways for your dog to travel, provided the crate is very sturdy and secured in place. If you have an SUV or similar vehicle, you may wish to place the crate in the cargo area of the vehicle. Just be sure to find out if this is the crumple zone in your car. 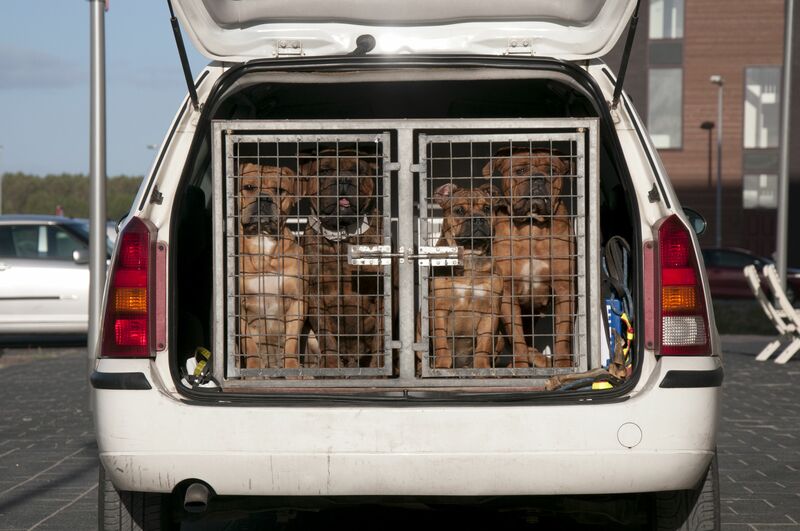 If so, the cargo area may be the worst place for your dog! A small or medium crate will typically fit in the back seat of most vehicles. Look for straps or harnesses that will keep the crate secured, or find a crate made to have a seat belt strapped to it. Otherwise, you can end up with a deadly projectile in the case of an accident. Also keep in mind that, if an accident does happen, your dog will be thrown against the walls of the crate upon impact, so injuries may still occur. A car harness or seat belt is another one of the safer ways to restrain your dog in the car. Car harnesses fit just like regular harnesses but are made to withstand the impact of a car accident. Look for a harness that fits your dog well and attached securely to your car's seat belts. Ideally, choose a harness like the Sleepypod Clickit, which has been proven effective in crash tests. Wide straps and padding in the area of the chest will help lessen damage from the impact. The tether that attaches the harness to the car's seat belts should be as short as possible to lessen the distance a dog is thrown during an accident. Thoroughly research the brand of the harness before you buy it to find out what studies the manufacturer has done. Dog car seats and booster seats are similar to car harnesses but designed for small dogs. The concept is to boost the dog up to a higher level where he can see, but to still keep him safe. Be very selective when choosing a dog car seat. Some are merely modified dog beds that provide little safety. Look for a seat that attaches securely to your car's seat belts and has a harness that attaches securely to the dog. Some have leash clasps meant to attach to your dog's own harness. Never hook this up to your dog's neck collar, as your dog can be strangled in a crash. Car barriers are designed to block off a section of the car. Some are placed behind the front seats to keep a dog in the back seats. Others are placed behind the back seats in SUVs to keep a dog in the cargo area. Barriers may be rigid and made of metal or plastic; they may also be soft and made of cloth or mesh material. The main safety benefit of barriers is that they keep your dog away from you, minimizing distraction. They may also prevent your dog from becoming a projectile in a crash. However, the barrier can easily come apart in the impact of a crash. Even if the barrier stays intact, the dog will still be thrown against it and around that area of the car. Basically, a barrier is better than nothing but not as good as a harness or crate. Which Dog Collar Is Best for Your Dog? Is the Premier Easy Walk Harness Right for Your Dog? Is the Gentle Leader Head Collar Right for Your Dog? Does the DAP Collar for Dogs Work to Reduce Stress and Maintain Calm? Is the FURminator Worth The Price?